Early on a warm July morning, about twenty Torrington Council Scouts made their way to Camp Workcoeman. While some may have been dropped off on West Hill Road, most of the boys took the Torrington-Winsted Trolley line. After getting dropped off near what is now Pinewoods Road, the boys walked north to West Hill Road, a mile along that, and finally another mile up the old logging road into camp. The boys may have traveled with fellow Scouts, but they did not function in their usual troops. Instead, when the Scouts arrived at camp, they settled into one of the four camper tents, and those tent mates formed the patrol they worked in for the remainder of their stay. The highlight of the program for most boys was West Hill Pond. With Chief Beebe’s experience and the staff’s training, camp program revolved around daily aquatics. Many of the Scouts who arrived on 14 July were prepared for a two-week stay, but more Scouts arrived every few days. To accommodate, the boys set up three more tents. Indeed, word of Camp Workcoeman brought new Scouts into Torrington’s troops. At the end of July, Workcoeman adjourned for two weeks. Now that Chief Beebe and the members of the Torrington Council had a little experience, they began to think long term. During the intersession, Beebe, along with Seymour Weeks and Ralph Fox, visited nine Scout camps, and fresh with ideas, they returned to open Workcoeman for two weeklong sessions. The first season ended with a flag ceremony on the evening of 31 August 1924. 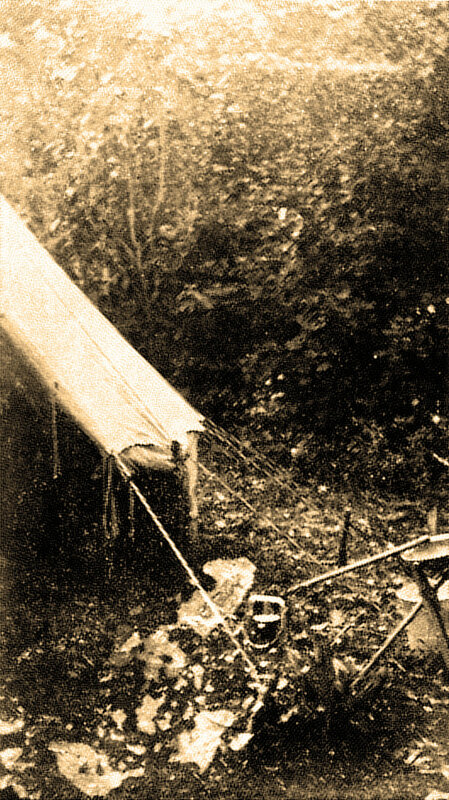 The photograph below shows Chief Beebe’s tent in 1924; note the wash basin to the right-hand side.